Our new range of V Sector Ball Control Valvesare robust, compact and designed to meet today’s process flow requirements; ideal for use in commercial and industrial process applications, comprising of a high performance modulating ball valve, quality actuator and state-of-the-art positioner. 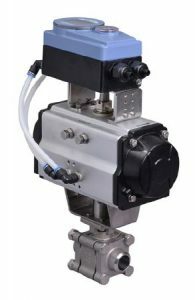 Our Pneumatic V Sector Ball Control Valveis the perfect choice for maintaining flow rates in continuous or batch processing operations, controlling the pressure of liquid filling lines and discharging the temperature of heat exchangers that have a steam feed line. Upon closer inspection you’ll find a V-port heavy duty, fully encapsulated 3 piece Stainless Steel ball valve with 50% Stainless Steel / 50% PTFE filled seats at the heart of our Pneumatic V Sector Ball Control Valve. Our heavy duty V sector ball valve offers many advantages over similar products by offering true 'V-port Technology' whereby the ball is machined to the correct V notch angle; as opposed to relying on a covering seat as used on other, less robust valves. Benefits provided by V-port Technology include increased longevity and improved accuracy of the complete assembly. A pneumatic actuator and digital electro-pneumatic positioner complete the line-up creating the perfect valve! Set up and programming is simple to undertake using the self-auto tune positioner, accepting 4-20mA or 0-10 volt input signals. The Pneumatic V Sector Ball Control Valve is available to order from stock with 30°, 60° or 90° V notch ball. Prices start from as little as £1,037.38, subject to size and configuration. After struggling for months and trying unsuccessfully to maintain a constant flow in an industrial heating system by using a manual globe valve, a company in the North East decided enough was enough and undertook a plan to go down the route of fitting an automated control valve. Using their existing pipework and utilising the compressed air on site to power the valve, Valves Online offered their latest addition of control valves and supplied a V sector ball valve PC4701 with pneumatic actuator and digital electro-pneumatic positioner to maintain this flow. In addition to supplying the control valve a flow sensor was supplied to give a flow signal (4-20mA) back into the valve positioner which modulated around this signal. No additional programmer or controller was required. The positioner was programed with the required flow set points (very easy to do) which incidentally featured a graphic backlit display and 'easy start' tuning function. Following testing, the system was commissioned and has now been running; offering trouble free operation, improved cost savings and a reduction in wastage, down to less than 0.5%. The company has since undertaken a program to automate key plant services. Where this system wins is that the flow sensor signal is wired directly into the positioner on the valve and actuator. Solenoids and digital programmer are built into one unit! An existing customer, based in Cornwall wanted to add chemicals into each and every batch they produced, which was then taken away by tanker. The product to batch was an emulsifier requiring a critical injected amount each and every time, to avoid wastage. In the past, operators used containers of emulsifier which were poured directly into the product, proving unsatisfactory / with mixed results. The most economical, accurate and simplistic solution for the customer was to recommend our PC4701 V Sector stainless steel ball valve fitted with a pneumatic actuator and electro-pneumatic positioner. 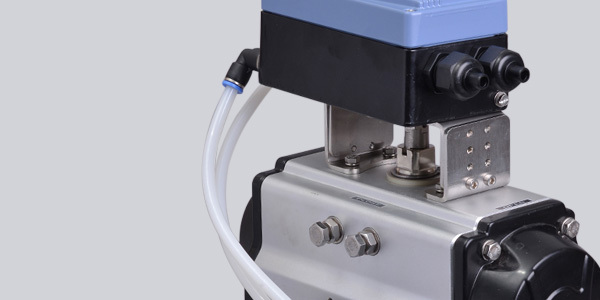 The valve was used to control the product with the addition of a mag flow meter (used to measure the flow) and wall mounted controller that allowed the operator to start injecting correct amounts for the various batches. This simple yet bespoke system was designed to meet the customers requirements. Matthew Hewett, Valves Online’s technical sales manager says... Customers love our comprehensive range of V Sector Ball Control Valves. V Sector Ball Control Valves match the control performance of globe valves, offering excellent modulating service but without the added cost! They’re compact, lightweight and easy to configure making the installation process simple. When you compare the cost savings, performance and improved efficiency control valves deliver to process fluid control the ROI is clear to see. As you can clearly see our Pneumatic V Sector Ball Control Valve is proving highly popular with customers, installers and engineers alike who recognise the savings, benefits and ease of installation. Take a closer look at your process flow control requirements, consider installing our Pneumatic V Sector Ball Control Valve and talk to a member of our technical team at Valves Online today - we're happy to take your call! For further information, technical datasheets or should you wish to check the correct sizing of your control valve please call our office on +44(0)1822 855600, +44(0)161 480 5700 or contact our technical department via email.